If your preschool-aged children are hungry we can help! Kids’ Meals delivers free, fresh, healthy meals, year-round Monday through Friday to hungry preschool-aged children who live within our delivery routes. 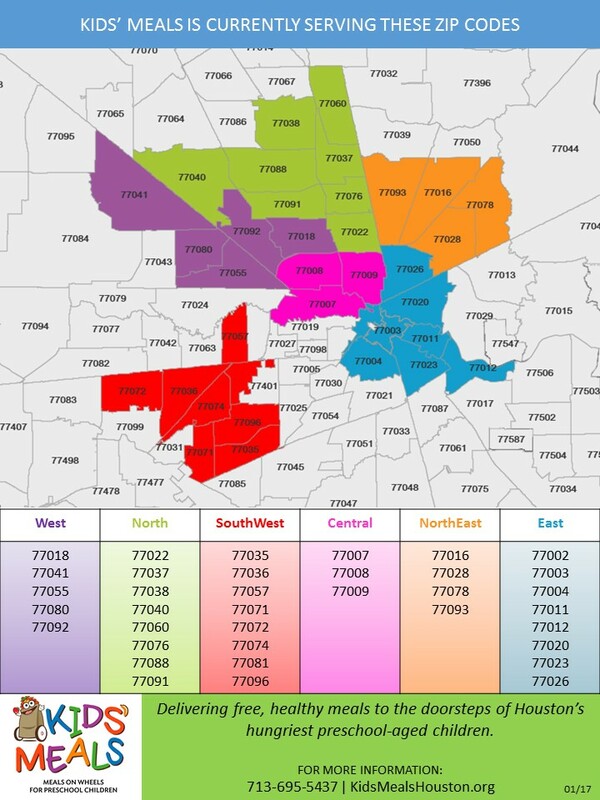 he easiest way you can see if you qualify for the Kids’ Meals program is to check our zip code map we’re currently serving. We have a pilot expansion route in Montgomery Country (zip code 77354). 1. Make sure you qualify. Children eligible for the program must be ages 5 and under, who live in our delivery zones, and qualify for our program. 2. Fill out the front and back of the application. 3. Turn in the application. Turn in (or fax 713-695-7544) the application to our office. Once your application has been processed, you will receive a call from our Operations Manager letting you know when meal distribution for your children will begin.